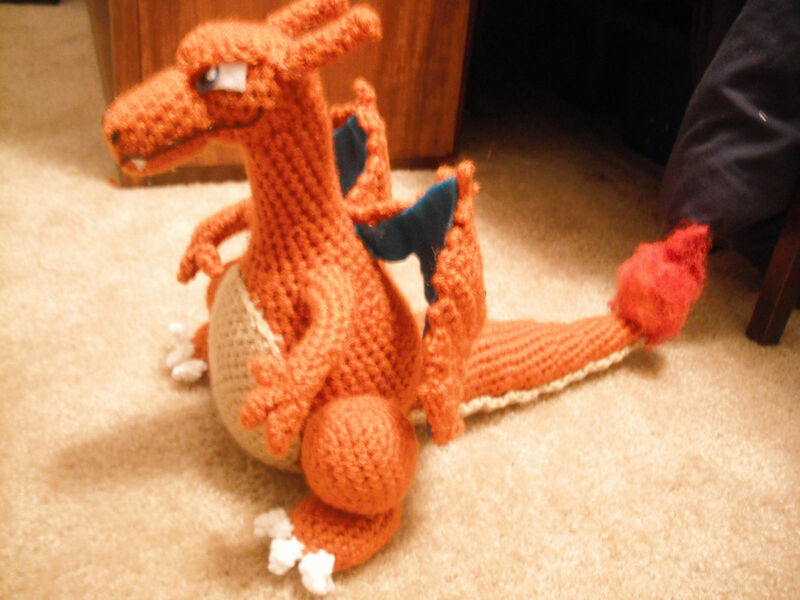 Beau has talked about me making a Charizard for a long time now. I was always hesitant (he made me a little nervous), but finally gave in as usual. He had some ups and downs along the way, his head was especially frustrating, but after a while he finally started coming together. The touch I am most pleased with is his flame. Beau and I have been trying to figure out how to make our Charmander’s flame (wolfdreamer) ever since I made it month’s ago. It finally hit me while playing with some polyfil, that it looked like a flame when shaped. Beau had some red and yellow paint and went at it! He mixed the paint into red, orange and yellow and at first tried to use a paint brush but eventually resorted to finger painting (Messy, but effective!). We both hope you like the latest pattern. If there are any mistakes with the pattern, feel free to leave a comment so I can fix it asap. F/O This will be attached to the body. F/O This is the farthest part of the wing away from the body. F/O This attaches to the other part of the wing and body. Row 8 is the row that attaches to the body. Begin by attaching the head to the body. Just sew the open part of the head around the open part of the body. Attach snout to head. Attach antlers to head. After felting the eyes, it is time for the brow. To do this Chain 7, sc in 2nd chain from hook and sc 5 more across (6). Attach to head. Look at pictures for placement. Attach leg to foot and then attach leg to body. Attach claws to foot, one in the middle and one on each side. Attach the start of Wing part 1 to the start of wing part two. This creates a nice way for the wings to bend. Row 8 of Wing Part 2 attaches to the body. I weaved in a piece of wire to each wing so they would stick up. Sew on belly spot. Then attach underbelly to appropriate area. Sew fingers to the arms and attach to body. Charizard and Pokemon are copyright Nintendo. omg that is soo awesome!!! if only i knew how to do that myself! Wow! He looks amazing! You did a really good job. I was wondering how big is he? Thanks! I’m glad you like hiim. 🙂 He’s around 9 inches tall. Hello! 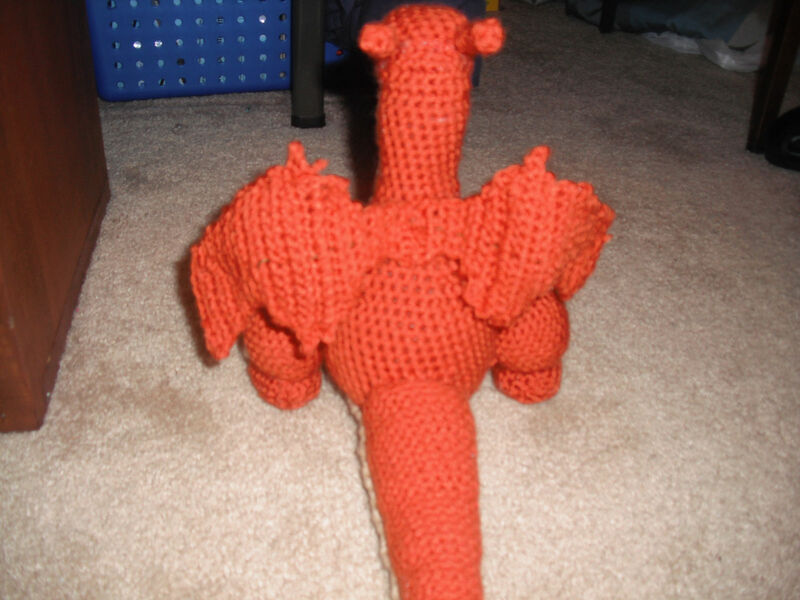 Thank you very much for your beautifull pattern… My doughter is very happy i promise her this marvellous Charizard!! I have some problem maybe becouse i’m non so good to crochet…..
-round 40, really i don’t know what to do….. What does it means do not chain1? and turn? Round 24 should definitely have *sc 5, dec over next 2 sc* around. Thanks for noticing. Also, round 40 should say *sc 14,turn* I added the do not chain 1 because sometimes when people turn their work they like to chain one and then go to the next row. I needed to double check the pattern to make sure there aren’t any other errors. If this wasn’t helpful, feel free to ask another question and I’ll try to help as best I can! I’m a little confused on the wings. Does that mean to sc 12 and then slip stitch? I’m sorry, I’ve never done a pattern at this level before and I’m still not great at reading patterns. I’ve just finish body and arms…. it’s amazing…..
for the foot round 3-9, you say that each row should be 16. if your still increasing every two it goes up. is that written wrong? so far this is amazing! i did add an extra row or two to the head and snout, and i did not see the fixed mistake on body with the sc 14 and then turn until now, but i still like how its turning out! i have the full head and arms attached to the body and am now working on legs,tail, under body etc. my nephew will get it for his 7th bday and i know hes going to love it! thanks so much! i completely understand about it being easy to write it wrong and im so glad you ask for people to point out errors! its so frustrating when people post patterns without the option to ask for clarification! i have one more question, are the claws/the white toes really two rows or are they supposed to be repeated? according to the pictures they look the same size as the fingers. I checked my charizard and I did only do two rounds…however it could be done larger if it works better for your charizard. Good luck working on him 🙂 Ask as many questions as necessary….I’m here to help! is this the chain row combined with a first row? even though the next part is labeled rows 1-3? im sorry im asking so much! its my first real pattern and i figure if i don’t understand something, someone els beginner or novice probably doesn’t either! thank you again for your patience. Sorry for the late response. I went out of town this weekend to visit some future family. Let’s see if I can clear the underbelly up. Chain 13 is the first row but I normally don’t ever count it as one. So chain 13, sc in 2nd chain from hook and then sc 11 more. That will give you a total of 12 sc which could then be considered row 2. then continue with where it says row 1-3 and that will have you on track. Hi there! This is a great pattern, and I’m really excited to see the end product when I’m done- hopefully it looks as good as the one you have posted here! I just have a quick question on the pattern for the body. On rounds 41-45, should I keep turning for every ’round’, or do I just turn the once after round 40? i get to sc 5 alright, but then i run out of room to do the last half. did i miss something in a previous row? I just wanted to say that I am so happy that you made/posted this pattern! I recently made wolfdreamer’s amigurumi squirtle for my boyfriend and now all his friends are wanting pokemon too! One of them specifically requested a charizard so I’m super happy that this pattern exists! I really can’t wait to see if/when you do post more patterns! That should give you 24 stitches I think. Sorry, I mean fourth row! Thats right! I’ll fix that asap. hi again! 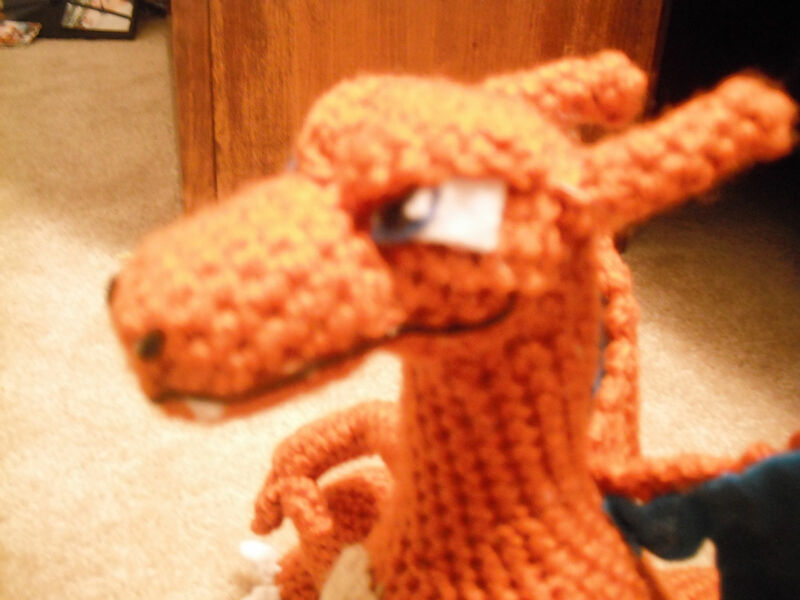 i finally finished charizard, instead of using felt i found embroidering (yarn and plastic needle) the eyes and inside of wings worked as a good alternative, although i kind of lost the shape of the wings alittle, it looks so cool! its like hes flying! again thank you for posting this pattern, i know my nephew is going to love it! i will definitly keep this bookmarked for your future patterns as i also have friends who want their own pokemon now! Great idea!! Don’t worry about all the messages, it’s good to share what you have done with others. Glad you like to patterns so much and hope you enjoyed it. Hi I’m a little confused on the snout round 3, do i sc 3, 2sc in next sc* for the next 4 rounds?? Round 3 should be *sc 3, 2 sc* around and then 4-6 should be *sc in each sc* around (15) Thanks for telling me and will be fixed soon! Thank you so very much for taking the time to share your pattern, and for free! It is very generous of you. 1) Wing-part 1: Row 2 going to row 3…When you write “skip 1st sc”, do you mean to skip the st that your yarn is already coming out of from the previous row (sl st) or the actual last sc of row 2? 2) Actually, in general, when you write “skip 1st sc” do you mean the loop that your yarn is coming out of from the last row or do you mean to st into the 2nd or 3rd st showing from your hook? 3) How did you attached the painted polyfil to his tail to make it stay? When I finish him, I plan to take pics and blog about it and will link to your site with a public note of THANKS for sharing. Anyone who can sit down to make something like this out of their head deserves lots of recognition!!! 1. skip the st the yarn in coming out of from the previous row. 3.the painted polyfil is attached with hot glue just like the felt. Thanks for your support. If you need a picture to explain the skip first sc part, I’d be happy to do that, i’m sure it would help alot of other people too! You can see one pic on my blog at http://yarnoveronce.blogspot.com/2011/12/christmas-miracle.html I may write a whole post about him with more pics later. Blogging takes up precious crochet time! I love it, my 4 year old brother has been asking me to make one. I finally found a good pattern, its looks great. Sooo excited to try it!! What i normally do is copy and paste the pattern into a word document and print them that way. I am wanting to move all my patterns over to pdf but i have not. I am horrible at cutting out the eyes? Any suggestions? GREAT pattern! I’ve completed the entire thing except for the felt eyes. My son loves it already! I am really terrible at cutting out felt for the eyes. Any suggestions? 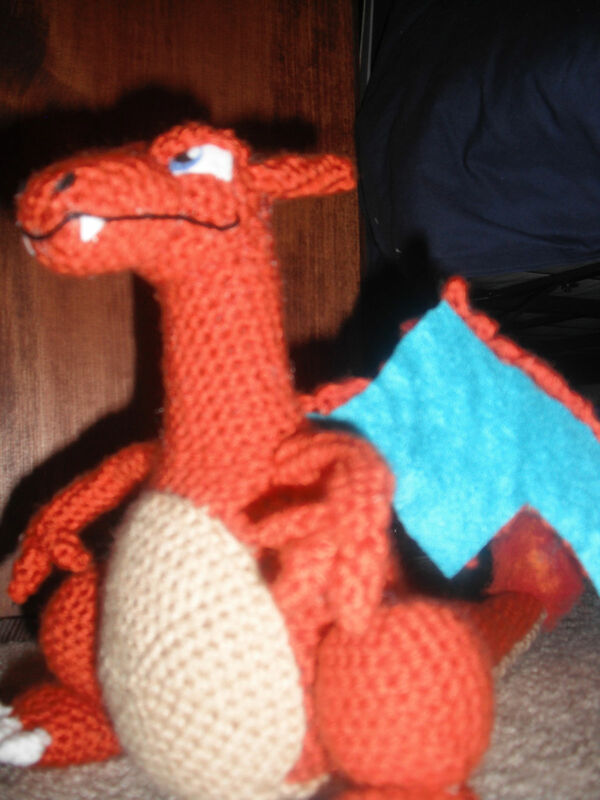 Other than that, my Charizard is finished. Great pattern! My son is really excited about it. I really like this pattern!! When my boyfriend say it i had to make it imidatly. He’s looking great, thanks!!! Do we just use any size hook? Which did you use/ prefer? I am sorry I just wasn’t sure. 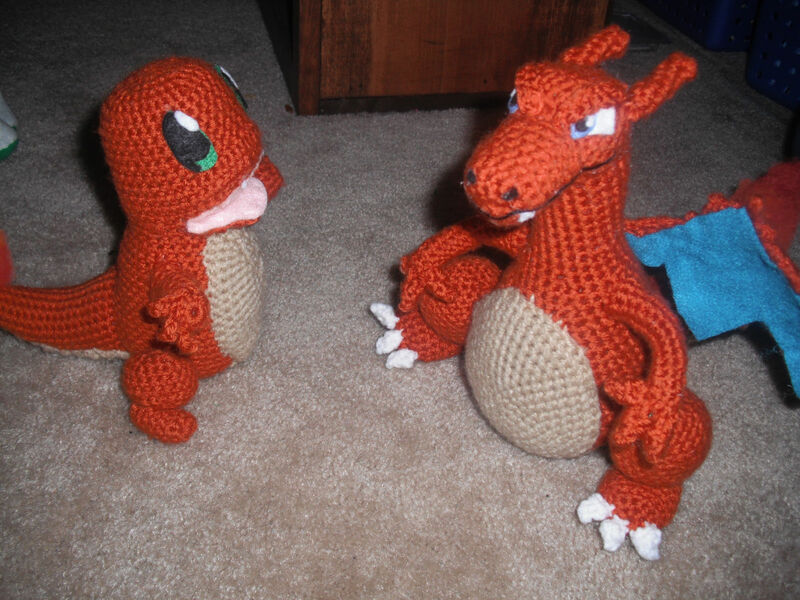 I love your pattern and your Charizard looks very realistic! Thank you for posting all these awesome patterns for free as well! for 99% of my patterns I use a G hook.